The gallery’s competition for March 2016 was the 6th Annual “Landscapes” Art Competition. 2D and 3D artists (including photography) from around the world, were called upon to make online submissions for possible inclusion in to the Gallery’s April 2016 online group art exhibition. Artists were asked for their interpretation of the theme “Landscapes” by submitting their best representational and non-representational art which depicts the theme “Landscapes”. The Landscapes theme includes any subjects such as the natural world, outdoor scenery, geographical environments’, scenic vistas and related landscape subjects. The art competition and the submission process for the artists began in February 2016 and concluded on March 27, 2016. The gallery received 738 entries from 28 different countries from around the world, including Australia, Austria, Bulgaria, Canada, Croatia, Czech Republic, France, Georgia, Germany, Hong Kong, India, Ireland, Italy, Kuala Lumpur, Lithuania, Malaysia, New Zealand, Norway, Poland, Scotland, Slovakia, South Africa, Sweden, Switzerland, United Arab Emirates, Ukraine, United Kingdom and Viet Nam. In addition, the gallery received entries from 37 different states. All winning entries will now be featured on the Light Space & Time website for the month of April 2016. Thereafter, the artworks and links to the artist’s websites will remain online in the Light Space & Time Archives. Congratulations to our artists who made our “Landscapes” Art Exhibition so successful this month. At any time, we invite our winning artists and other interested visitors to link their websites to the Gallery’s archive page for further ongoing promotion. Overall Winning Artists Category – The overall winning artist’s category consists of the 10 Best Entries received from the Painting & Other and Photography & Digital media categories. Please go to the results of the Landscapes Art Exhibition “Overall Winning Artists” Category here. Special Merit Award Category – These are the artists and their artwork which we felt could easily have been placed higher but due to the size constraints in each media category, this art was placed in this special category. Any of the Special Merit art, in many cases, is interchangeable with the best art that we selected for the top tiers. Please go to the results in the Landscapes Art Exhibition “Special Merit Award Category” here. In addition, this category also includes any 3D art, fabric, mixed media, mosaic, and various other media. 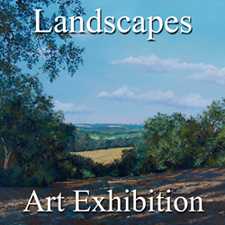 Please go to the results in the Landscapes Art Exhibition “Painting & Other Category” here. In addition, this category also includes most digital art in this section. Please go to the results in the Landscapes Art Exhibition “Photography & Digital Category” here.